Arkady Shalvovich "Badri" Patarkatsishvili (Georgian: ბადრი პატარკაციშვილი 31 October 1955 – 12 February 2008) was a Jewish-Georgian businessman who also became extensively involved in politics. He contested the 2008 Georgian presidential election and came third with 7.1% of the votes. Although his first name was Arkady, he was best known by the nickname "Badri". From the early 1980s, until the time of his death, he was a flamboyant figure in business and was behind some of the most successful companies in today's Russia. From humble origins, he became the wealthiest citizen in Georgia with an estimated wealth of $12bn. He was also one of the country's largest philanthropists. Patarkatsishvili suddenly died intestate in February 2008 sparking one of the largest estate battles in legal history. In October 2018 the government of Georgia officially accused the former president of Georgia Mikheil Saakashvili of ordering assassination of Badri Patarkatsishvili. Born in Tbilisi to a Jewish family, Patarkatsishvili became an active member of the Komsomol, the youth wing of the Soviet Communist Party during the 1980s. He eventually became Komsomol leader at Maudi, a large textile operation. In 1984, Badri became Deputy Director General of Gruzavtovazprom, a company that purchased and delivered cars and spare parts from AvtoVAZ, which was at the time, the largest car manufacturer in the Soviet Union. It was during trips made to the AvtoVAZ plant that he first met Boris Berezovsky who was to become a close friend and business associate. In 1989, Badri and Berezovsky founded LogoVaz with some of the senior executives of AvtoVAZ. LogoVaz developed software for AvtoVAZ, sold Soviet-made cars and serviced foreign cars. It was established as a joint venture with Logo Systems, an Italian company, which at the time was seen as pioneering in commercial relationships between East and West. LogoVaz established an office in Georgia and Badri became Deputy Director General of the company. In 1992, Badri and his family moved to Moscow where he quickly became part of Berezovsky's increasingly influential political circle. LogoVaz had by this time become an extremely successful company and had made Badri a wealthy man. At the time, the Soviet Union was collapsing and there was a great deal of political uncertainty in the region. Badri, along with Berezvosky and other successful businessmen were supportive of Boris Yeltsin as he had liberalised trade with foreign countries, allowing their businesses to grow, however the wider economy was performing badly and there was growing support for Nikolai Ryzhkov's reformed communist party. By 1994, Berezovsky had secured control of ORT, the largest TV station in Russia at the time, and he installed Badri as First Deputy General Director. Badri and Berezovsky then use the station's influence to assist Boris Yeltsin to victory in the 1996 presidential election. From 1994 until mid 2000, Badri was a key figure at ORT. In 1997, he was selected to oversee the privatization of the Sibneft oil company. Sibneft was the youngest oil holding company in Russia at the time having been created hastily in early 1995 out of Rosneft. An unknown entity, Oil Finance Corporation (NFK), that had been created out of Menatep, a holding company started by Mikhail Khodorkovsky, won the auction. Berezovsky had an interest in the Menatep Group and for this reason, there was some speculation that the auction had been fixed. It later emerged that the company had been sold for a fraction of the market value. After Badri died, in 2012, the Sibneft privatisation was to become the subject of a high court legal battle between Chelsea football club owner Roman Abramovich and Berezovsky. According to The Times, Roman Abramovich submitted a 53-page court defence that accused Boris Berezovsky and Badri Patarkatsishvili of demanding huge sums for helping him to rise from obscurity. Badri emerged as the key intermediary, passing messages between Abramovich and Berezovsky. Badri was offered $500 million by Roman Abramovich, the defence papers that were submitted admit, for protecting Roman in Russia's aluminium wars. Following his success at ORT, in April 2001, Badri was appointed General Director of Russia's TV6 channel, which, like ORT, was partly owned by Berezovsky. Under his control, TV6 became notorious for its anti-Kremlin line. In the late 1990s, Berezovsky and Badri also purchased Kommersant the one of Russia's most influential political newspapers. In 2006, Berezovsky sold his controlling stake to Badri increasing Badri's holding to 100%. Badri then organised the sale of Kommersant in August 2006 to senior Gazprom executive Alisher Usmanov. By mid 1999, Boris Yeltsin began losing his grip on power and Boris Berezovsky began to play an important role in the hunt for his successor. He did this in order to counter the political aspirations of the Prime Minister Yevgeny Primakov, who was seen as more of a statist. As Berezovsky lost favour with the Kremlin, investigations began into his business affairs which Berezovsky claimed to be politically motivated. This eventually led to an arrest warrant for Berezovsky being issued in April 1999 by the Prosecutor General, Yury Skuratov. Although Badri had sought to distance himself from Berezovsky's political dealings his proximity to Berezovsky was such that he began to fear that he may also be arrested so in 2000 Badri left Moscow for his native Georgia. When Vladimir Putin was elected in March 2000, Badri hoped that the situation for Berezovsky and himself in Russia would improve. He and Berezovsky had supported Putin in his election campaign. Badri later claimed that he had recommended Putin to Pavel Borodin, then a senior member of President Boris Yeltsin's Kremlin administration. Berezovsky had also gotten Putin appointed as Russian FSB director. However, Berezovsky quickly fell out with the new president. On May 31, Berezovsky sharply attacked the constitutional reform proposed by Putin, which would give the Kremlin the right to dismiss elected governors. In an open letter to Putin published in Kommersant Berezovsky, then a Duma deputy, said that he would be obliged to vote against the president's legislative project, which was "directed toward changing the state's structure" and represented a "threat to Russia's territorial integrity and democracy." Things came to ahead in August 2000 when Berezovsky used ORT to attack Putin for his handling of the sinking of the Kursk submarine, blaming the death of 118 sailors on the Kremlin's reluctance to accept foreign help. This began to put pressure also on to Badri, whose association with Berezovsky was well known and was at the time, controlling the ORT station. In December 2000, Nikolay Glushkov a co-founder of AvtoVAZ and a close associate of Badri and Berezovsky was arrested as part of the Russian Prosecutor General's investigation in Aeroflot, a company that Berezovsky had an interest in. Badri and Berezovsky believed the arrest to be politically motivated and part of the Kremlin's attempt to put pressure on their businesses. Glushkov suffered from a hereditary blood disease and had to receive special medical treatment in hospital. Badri and Berezovsky began negotiations with the Government for his release agreeing to give up their media interests and for Berezovsky to end his political ambitions. However, in June 2001, the Russian Prosecutor General's Office charged Badri with organizing an attempted escape from prison of Glushkov and issued an arrest warrant for him through Interpol. Knowing that he would not be given a fair trial, Badri refused to come in for questioning and, on July 4, 2001, he gave an interview to the Kommersant newspaper setting out his version of events in an attempt to clear his name. To avoid prosecution in Russia, Badri moved to Tbilisi where he had been granted political asylum. Further charges relating to the misappropriation of AvtoVaz were added in October 2002. Upon his return Badri began investing much of the vast wealth that he had accumulated in Russia into his native country. He had become personally wealthier than the entire state budget and so was able to invest in business ventures and charitable projects in a scale that had been previously unimaginable to the impoverished country. He bought the Tbilisi city football team, Dinamo Tbilisi, the Kulevi oil terminal and financed a new shopping centre in the capital and a holiday resort on the Black Sea. He also became the head of the federation of Georgian businessmen and head of the Georgian National Olympic Committee, subsidized social programs and cultural activities, and on two occasions paid debts for the gas and electricity consumed by Tbilisi residents. He funded several charity projects including schools, amusement parks - even a monastery. In return for these paternal gifts, the then president Eduard Shevardnadze agreed to allow Badri the state's protection from charges against him in Russia. In December 2001, he founded Imedi Media Holding, the first independent broadcasting station in Georgia. During his early career, Badri had shown little interest in politics. However, when the Rose Revolution began in 2003 and Badri could see that Eduard Shevardnadze was losing his grip on power, he used his wealth to support the new opposition candidate Mikheil Saakashvili. Relations between Badri and Saakashvili soon deteriorated however and they became bitter rivals. Badri claimed that this was due to the coverage given by Imedi to opposition parties, Saakasvili however claimed that Badri was attempting to use his wealth to gain control of business life in Georgia. 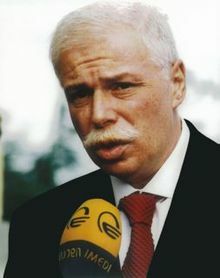 Badri began financing opposition parties in late 2006 and early 2007 and a pro-Patarkatsishvili group in parliament soon emerged that developed into the Our Georgia party. In late 2007, he became embroiled in a political scandal after former defense minister Irakli Okruashvili on September 25, 2007, accused Mikheil Saakashvili, the President of Georgia, of planning Patarkatsishvili's assassination. Arrested on corruption charges, however, Okruashvili retracted his accusations against the president, winning release on bail of 10 million Georgian lari (about 6,250,000 USD). He also said that his earlier accusations levelled against Saakashvili were not true and were aimed at gaining political dividends for himself and Badri Patarkatsishvili and at discrediting the President of Georgia. On November 6, Okruashvili, said on Patarkatsishvili's Imedi TV - by then managed by Fox TV's parent News Corporation - that he had been forced into retracting his accusations against Saakashvili by pressure that he endured in prison. Down the line from Munich, he said: "All of those accusations, all of those facts that I brought against Saakashvili, everything I said about him is the plain truth." As Badri lost favour with Saakashvili's government In 2007, numerous allegations of corruption were made against him. He was impeached as president of the Georgian National Olympic Committee, and also quit as a president of the Georgian Business Federation. Tbilisi-based Rustavi 2 TV, a channel controlled by Saakashvili's government, linked his name with several notorious murders in Russia and Georgia, including the assassination of Vlad Listyev. On October 29, 2007, Badri publicly announced his plans to finance ten opposition parties' campaign aimed at holding early parliamentary elections in April 2008. On November 2, 2007, he addressed a large anti-government rally held in downtown Tbilisi and pledged to further support it. He left Georgia for London shortly afterwards. After the demonstration turned violent, following police attacks, on November 7, 2007, Georgia's Chief Prosecutor's Office announced that he was suspected of conspiracy to overthrow the government. Nevertheless, he said he would run in the January 5, 2008, snap presidential elections under the slogan "Georgia without Saakashvili is Georgia without Terror." Leaders of the major opposition parties distanced themselves from Patarkatsishvili, who had to run as an independent presidential candidate. On December 24 and 25, 2007, the prosecutor-general's office of Georgia released a series of audio and video recordings of the two separate meetings of the high-ranking Georgian Interior Ministry official Erekle Kodua with Patarkatsishvili and the head of his pre-election campaign Valeri Gelbakhiani. According to the government, Patarkatsishvili was trying to bribe Kodua to take part in what the Georgian officials described as an attempted coup d'état on January 6, 2008, the next of the scheduled presidential elections. The plan included to stage a mass manifestation against the government and to "neutralize" the Interior Minister Vano Merabishvili. Later independent journalist Vakhtang Komakidze produced what he said was the full transcript of the recorded conversation which showed that Patarkatsishvili was advising against violence and the extracts released had been doctored The accusations forced Patarkatsishvili onto the defensive. He confirmed that he met with Kodua in London, but denied that the bribe was in connection to an alleged coup plot and claimed instead that his intention was to uncover what he said were official plans to rig the election. He also confirmed that he offered Kodua "a huge amount of money" in exchange for defecting from the authorities allegedly to avert a possible use of force by the government against the planned January rallies. On December 28, 2007, Patarkatsishvili announced that he would withdraw his bid for presidency, but would nominally remain a candidate until January 4, 2008. On January 3, 2008, he reversed himself, however, and decided to run in presidential elections. In response, his top campaign official Giorgi Zhvania (brother of Prime Minister Zurab Zhvania) resigned, declaring that Patarkasishvili did not have the unquestionable reputation one would expect of a country's president. Patarkatsishvali was chairman of the Dinamo Tbilisi soccer club. He also served as president of the Georgian National Olympic Committee (GNOC), until being impeached on October 9, 2007, after falling out with the government. In September 2006, Badri announced that he was considering a bid for the London football club West Ham. However, the deal never came to fruition. Patarkatsishvili was married to Inna Gudavadze. The couple have two children, Lianna Zhmotova and Iya Patarkatsishvili. Patarkatsishvili, aged 52, collapsed at Downside Manor, his mansion in Leatherhead, Surrey, England on February 12, 2008, at 10.45 pm. Ambulance crew members tried unsuccessfully to resuscitate him, but he was pronounced dead at 10.52 pm. As in any other case of unexpected death, Surrey police treated the case as "suspicious" and launched an official investigation. The businessman spent his last day in the City of London office of international law firm Debevoise and Plimpton, meeting his business partner Boris Berezovsky, his spokesperson Lord Bell and his lawyer Lord Goldsmith QC, as well as fellow exiles, the Russians Nikolai Glushkov and Yuli Dubov From the City he left for Down Street, Mayfair, to visit Berezovsky's office, and at 7.00 pm was returned to Leatherhead with his Maybach. Shortly after dining, Patarkatsishvili told his family he felt unwell and went upstairs to his bedroom where he was found unconscious after a heart attack. Preliminary reports indicated a heart attack as the cause of death. According to the first post-mortem tests, the death of Patarkatsishvili appeared to have been from natural cardiac-related causes. According to the pathologist Ashley Fegan-Earl, he could identify a "severity that could have resulted in a sudden and unexplained collapse and death at any time." He also concluded that chest pain that Patarkatsishvili had had and a sudden collapse "were consistent with death due to coronary heart diseases." Patarkatsishvili's father, Shalva Patarkatsishvili, also died of a heart attack at an early age of 48. The businessman had no history of illness but was reported to have led an unhealthy lifestyle, smoking excessively and taking no exercise. According to Lord Bell, "he [Badri] always looked 10 years older than he was." However, theories of a possible assassination were considered seriously by some. "[A] number of compounds known to be used by the former KGB can induce heart failure, but leave virtually no trace. One is sodium fluoroacetate, a fine white powder derived from pesticide." The British police checked Patarkatishvili's Surrey mansion for radioactive elements but reportedly found none. London Lite was the first newspaper to inform the British public of the Georgian oligarch's death on the evening of 13 February 2008. In the news of 14 February 2008, Patarkatsishvili's death was covered in The Guardian, The Times, Financial Times, The Daily Telegraph, The Independent, etc. Most newspapers discussed Patarkatsishvili's business history, including his close ties with Boris Berezovsky, Roman Abramovich, Alexander Litvinenko, Mikheil Saakashvili and Vladimir Putin. Reuters reported that Patarkatsishvili feared the Georgian authorities were plotting to kill him, a source close to the late businessman said on the day of death." Associated Press reported that on December 26, 2007, Patarkatsishvili said that he had obtained a tape recording of an official in his homeland's Interior Ministry asking a Chechen warlord to murder the tycoon in London. "I believe they want to kill me," he said. He said the tape had been given to police. Novaya Gazeta reported the following information. Patarkatsishvili, living in London, was approached by members of the Saakashvili government demanding that he sell his controlling share in the dissident Imedi TV network. Initially, Patarkatsishvili refused, but was then offered an unprecedented deal: exchanging ownership of Imedi for ownership of the entire Georgian railroad system. Being a businessman, Patarkatsishvili reportedly agreed; however, when the Saakashvili side sent him the contract, there was a new clause, which required Badri to invest $2,000,000,000 in the "improvement" of the railroad property. He refused, but died shortly after. Novaya Gazeta's source is one of the lawyers from the legal side of this deal. Following Badri's death, several of his closest business associates made attempts to fraudulently claim his business assets from his family members, who were (Badri having died without leaving an valid will), under Georgian law, entitled to his residual estate. Shortly after Badri died, Joseph Kay, the stepson of Patarkatsishvili's aunt and someone who had assisted Badri with his business affairs, along with the American lawyer, Emmanuel Zeltser, attempted to take control of Imedi, Mtatsminda Park and the Rustavi Metallurgical Plant in Georgia, as well as other assets belonging to Inna Gudavadze and the Patarkatsishvili family, including a large development on Fisher Island in Florida, by claiming to be in possession of Patarkatsishvili's last will and testament that appointed Kay as executor of the estate. These documents were later declared to be forgeries in the UK High Court. Kay's case was comprehensively dismissed by Mr Justice Dudley in the Supreme Court of Gibraltar in February 2010. Justice Dudley described Kay's case as "wholly unconvincing" adding that he was a "mendacious individual" and "certainly not a witness of truth." After several further legal battles in the US, UK, and Georgia, the assets were returned to the Patarkatsishvili family. Another claim over the estate was launched in 2012 by Boris Berezovsky. Berezovsky claimed that half of Badri's assets belong to him under a handshake agreement that the two men made in 1995 to split all their commercial interests equally. However, following the judgement of Gloster J in Berezovsky v Abramovich 2012 that gave a damming report of Berezovsky's character, Berezovsky quickly settled his case against the Patarkatsishvili family. The details of the settlement however remained confidential. In 2013, Inna Gudavadze, her two daughters, Iya Patarkatsishvili and Liana Zhmotova, and Badri's mother Natela Patarkatsishvili brought a $1.8bn action against another of Badri's business associates, Vasily Anisimov. The family claimed that they had a part-entitlement to the 20% share formerly held by Anisimov in mining company Metalloinvest. The case was settled in March 2014 before it came to court. ^ "В избирательных бюллетенях Бадри Патаркацишвили будет Аркадием (Грузия)". Regnum. 2007-11-28. ^ The Richest Georgians of the World. Georgian Times, 04-06-2008 Archived 2011-07-22 at the Wayback Machine.Accessed: 04-05-2008. ^ "პროკურატურის განცხადება ბადრი პატარკაციშვილის მკვლელობის მომზადების საქმეზე" [Statement of Prosecutor's Office on Badri Patarkatsishvili's murder case]. Government of Georgia. ^ Rochvarger, Michael (5 June 2007). "Badri Patarkatsishvili, future owner of Maariv?". Haaretz. Retrieved 25 November 2013. ^ "Badri Patarkatsishvili: Billionaire businessman who failed to buy his way into the presidency of Georgia". The Independent. 14 February 2008. Retrieved 25 November 2013. ^ BADRI PATARKATSISHVILI: FROM RUSSIAN BUSINESSMAN TO GEORGIAN PRESIDENTIAL CLAIMANT (part two) The James Town Foundation, 21 December 2007. ^ Obituary: Badri Patarkatsishvili, Tom Parfitt, The Guardian, London, 02-15-2008.Accessed: 04-05-2008. ^ Okruashvili May Be Freed on Bail after Pleading Guilty. Civil Georgia, 2007-10-08. ^ Court sets Georgia's former defense minister free on bail. Associated Press (International Herald Tribune). October 8, 2007. ^ News Corporation: A farewell to Georgia?, Giorgi Lomsadze, Eurasia Insight, Eurasianet.org, New York, NY, 03-26-08.Accessed: 04-06-2008. ^ Firebrand Okruashvili’s Televised Return Boosts Opposition, Radio Free Europe, 11-06-2007.Accessed: 04-06-2008. ^ Patarkatsishvili Pledges to Finance Protest Rallies. Civil Georgia. 2007-10-28. ^ Patarkatsishvili Addresses Protest Rally. Civil Georgia. 2007-11-02. ^ Patarkatsishvili Suspected of "Coup Plotting". Civil Georgia. November 9, 2007. ^ Patarkatsishvili Says he will Run for Presidency. Civil Georgia. 2007-11-10. ^ In Quotes: Opposition Leaders on Patarkatsishvili’s Presidential Bid. Civil Georgia. 2007-11-10. ^ Patarkatsishvili Ally a Suspect in Coup Plot. Civil Georgia / 2007-12-24 13:22:55. ^ More ‘Coup Plot’ Tapes Released. Civil Georgia, Tbilisi / 2007-12-25 20:33:27. ^ Patarkatsishvili Forced onto Defensive Archived 2008-08-30 at the Wayback Machine. Georgian Times [Civil Georgia]. 2007.12.26 12:52. ^ "Georgian Business Tycoon Patarkatsishvili Withdraws from Presidential Race". VOA News. Voice of America. 27 December 2007. Archived from the original on May 22, 2011. Retrieved 2008-12-27. ^ Patarkatsishvili Nominally Remains in Race. Civil Georgia. 2007-12-28. ^ Georgian Media Tycoon Returns to Presidential Race. Voice of America. January 03, 2008. ^ Georgian Olympic Committee Impeaches Patarkatsishvili.Civil Georgia. 2007-10-09. ^ "Georgia tycoon death 'suspicious'". BBC News. 2008-02-13. Archived from the original on 17 February 2008. Retrieved 2008-02-13. ^ Gus Garcia-Roberts (November 17, 2011). "Russian billionaires battle for Fisher Island". Miami New Times. ^ Robert Booth (February 14, 2008). "I am a target: police probe death of billionaire who warned of assassination". The Guardian. ^ "Prominent Georgian businessman and opposition leader Patarkatsisvhili dies (Part 2)". Interfax. 2008-02-13. Archived from the original on 2012-02-14. Retrieved 2008-02-13. ^ "Georgian billionaire Badri Patarkatsishvili had severe heart disease, inquest hears - Mirror.co.uk". Archived from the original on 2008-02-18. Retrieved 2018-04-02. ^ "Tycoon died of natural causes". The Sun. London. 2008-02-14. ^ "The Guardian and Observer Digital Editions". The Guardian. London. ^ Faulconbridge, Guy (2008-02-13). "Georgian Patarkatsishvili feared murder plot". Reuters. Retrieved 2008-02-13. ^ "Особое мнение. Дмитрий Муратов". Echo of Moscow. 2008-02-13. Archived from the original on 2008-02-15. Retrieved 2008-02-13. ^ "Сделка не состоялась. Чем занимался в последние дни перед смертью Бадри Патаркацишвили (in Russian)". Novaya Gazeta. 2008-02-14. Archived from the original on 16 February 2008. Retrieved 2008-02-16. ^ The odd couple and their extraordinary labyrinth of wealth The Times, 21 January 2012. ^ Berezovsky settles Patarkatsishvili lawsuit Financial Times, 13 September 2012. ^ Patarkatsishvili family reaches deal over Metalloinvest stake Financial Times, 14 March 2014. Wikimedia Commons has media related to Badri Patarkatsishvili. This page was last edited on 11 April 2019, at 17:29 (UTC).